Receipt Bank is proud to be the Platinum Partner of this year's Australian Accounting Awards, the first national awards to recognise excellence across the entire accounting industry. Receipt Bank's Australia country manager, Sophie Hossack, will be presenting Thought Leader of the Year, Partner of the Year (boutique firm), Bookkeeper and Bookkeeping Firm of the Year on the night. Many of this year's nominees are Receipt Bank Partners, featuring in 20 out of 23 categories. To celebrate their remarkable achievements, we spoke to some of the nominees to learn more about their journey, and how they created an award-worthy service. When Link Strategies (formerly Link Bookkeeping) was started, there was a need in the market place for real-time bookkeeping services. After a slow burn and a gradual build for the first year, we pushed hard on the Xero growth curve and were adding new clients every couple of days. I have a passion for working with people, and my passion turned into a team. I believe we've now got a really fun team, and provide an exceptional service to our clients. I'd like to think we've been nominated because we do it a little differently. We've focused inwards. Building culture and fostering our people. The award brings affirmation that we are on the right track and are staying ahead of the curve! We believe in doing things differently. This message is being recognised amongst peers and the SME community. I’m thrilled to have been named as a finalist for Bookkeeper of the Year in the Australian Accounting Awards. I’m delighted to be recognised for my contribution to the industry and as an innovative, modern bookkeeper. It's wonderful to be amongst a line-up of amazing finalists and I’m looking forward to Friday night. Good luck to all. We are unique in that we provide a business support hub. We don’t just offer standard bookkeeping and BAS services. We exist to help our clients every step of the way, from a start-up to a saleable business. Our mantra is to support our clients to flourish in business. With passion, expertise and innovation, we aim to empower our clients with increased cash flow and profitability, greater control and the freedom to focus on what they love to do. We are their mentor, their experienced and trusted advisor. We focus on supporting our clients with automation and innovation, we provide support and motivation, the confidence and freedom to understand their business, and we ensure all obligations and requirements are met. Bookkeeping in the age of automation is our speciality. We have been early adopters of the automated accounting environment and believe it is a wonderful progression for the industry with meaningful benefits to our clients and practice. I am thrilled to be a finalist for the 2017 Australian Bookkeeper of the Year, and to be recognised as one of Australia’s leading accounting professionals, in a year of record submissions. The recognition of our efforts and expertise, our passion and innovation, by the Australian Accounting Awards, reinforces the value and significant difference we provide to our clients and industry partners. One of the things that is in build into my DNA is to question things. I don’t accept things being done “just because it’s always been the way” and I love technology and the changes that it is bringing to our industry. I strive to find better ways for my clients and I fight for them every step of the way. Customer service and integrity are at my core values and I have mentored the team to foster the same values. I believe in collaboration and sharing our knowledge to help others both inside and outside of our industry be better professionals. Although challenging and hard work, we believe in continual growth—for us and our clients. That’s why we’ve developed and marketed new options for our clients, enabling us to add value to their businesses and making their lives easier. This in turn leads to a loyal and expanding client base. For us, it’s all about strength in numbers and a strategic alliance with clients. It’s a fabulous formula. Many factors are at play, including being clear in our minds how we stand out in our field and maintain a competitive edge in our crowded industry. We have a well-thought through growth strategy which includes new services, refined services and full migration support services. We invest in marketing. We invest in staff training. We invest in internal systems so staff can dedicate more time to driving business. We invest in staff development. It means the world to me to be nominated, for the business and especially for my staff, who have been by my side on this journey, supporting me all the way. To be nominated for both awards is incredible. It’s made us, as a team, even more determined to continue to grow and evolve. It’s part of our ethos to celebrate our wins and these nominations are big wins for us. It's all about being consistent in our delivery across the team and ensuring our values are aligned. We don’t sacrifice on quality and hence our growth is deliberately progressive. We love automation and everything it stands for. Our role is to help business owners implement and leverage off technology so they can manage their business better. We get a real buzz when we see clients have that ah huh moment when we educate them on the numbers that count. To deliver and do both well means we are here for the long run to serve and support small business. It means that we are being recognised for continuing to strive for customer excellence and that the All That Counts team of today and tomorrow will keep building on that foundation. 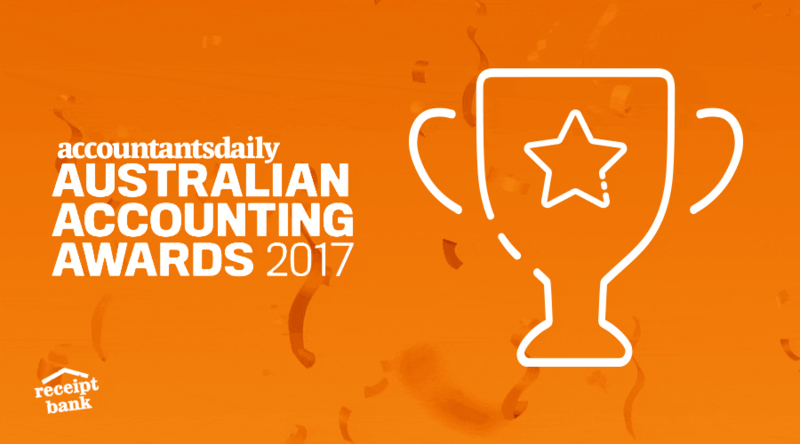 This is the third year in which we’ve been finalists for the Australian Accounting Awards, and it means a lot to be considered alongside other amazing businesses in Australia. Awards are nice, but for us success comes down to a simple focus. Business in the end is really simple – do the best you can for your customers, and the people you encounter each day, and always look for ways to improve and do better. Do that, and the rest flows from it. We’re really excited and optimistic for the future. Both from the point of view of some of the fun and innovative things we have in the works, but also in the change being driven in the industry right now by technology. It’s a great time to be a bookkeeping firm in Australia. A huge congratulations to all the nominees, Receipt Bank Partner or not, and we wish you the best luck for the big night. See you there! This piece is brought to you by Receipt Bank.